This digital vintage graphics set includes a total of 28 images of cooking themed vintage kitchen ephemera that are now in the public domain. With a wide variety of different images from vintage stoves and refrigerators to old flour and baking soda advertisements, there are many ways you can use these vintage cooking ephemera digital files! Whether you are looking to create art with a vintage kitchen theme or creating recipe and cookbook pages for heirloom scrapbooking, these images are the perfect addition to your creative projects. You can also print these images out for image transfers onto wood for your very own unique kitchen decor projects! All of our images are high resolution files created at 300 ppi for high quality crisp printing. Most images are sized between 4 inches – 8 inches at 300 pixels per inch, so they can also easily be resized for your own needs for a number of creative projects. We also created several print-ready files to make it easy to print out for all of your paper crafting and DIY projects. No tech skills necessary! 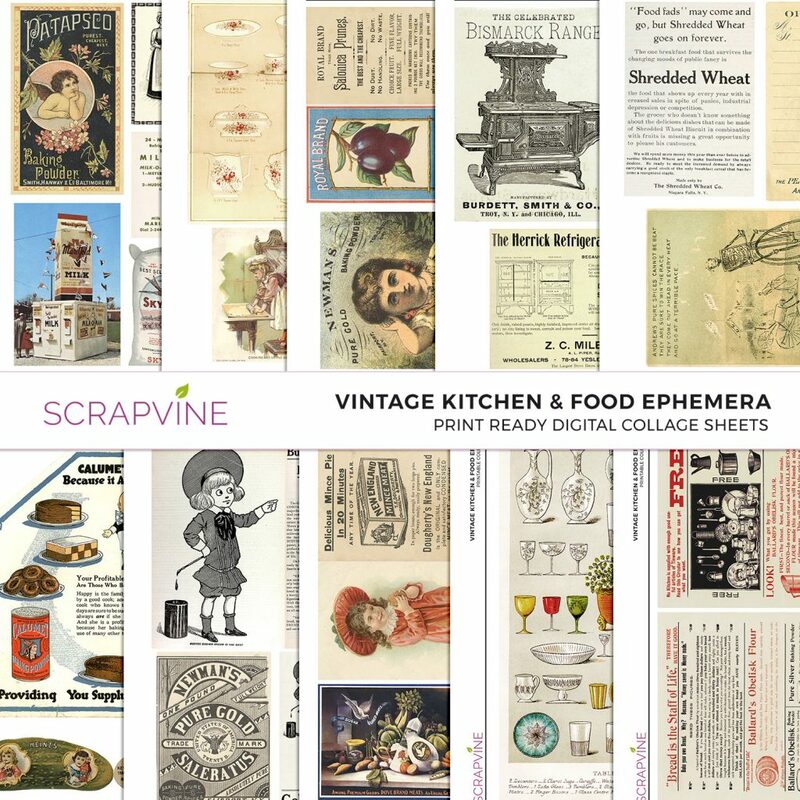 You can use these vintage kitchen ephemera graphics in your digital art and digital scrapbook pages, or print out to use for junk journals, art journals, scrapbooks, and photo transfers! There are a total of 5 download parts to this set, with each download averaging about 75-85 megabytes file size. 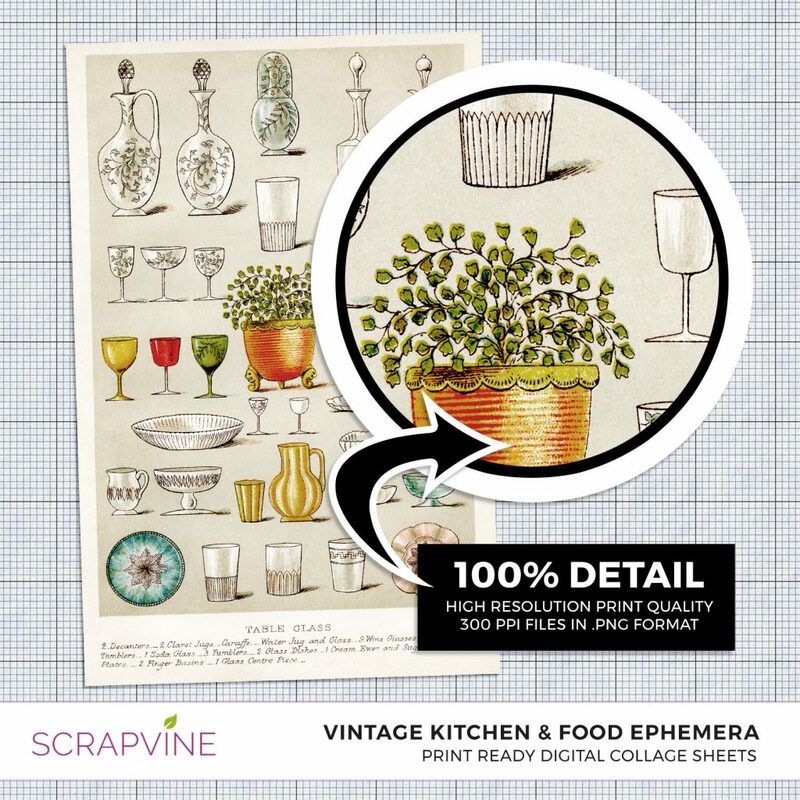 I hope you enjoy these free printable vintage kitchen ephemera images. Make something fun? Tell us about your project in the comments section below!